500 feet above the sea at Camp Mendocino, 1937. From its establishment in 1914 until 1961, the UW Department of Architecture kept a collection of its students' drawings. These served as teaching tools, as well as an archive of the development of its curriculum. The archive contains student drawings judged to be meritorious at the time of completion; items are often stamped "Retained." Often the drawings also bear the grades of the faculty jurors, usually written in red grease pencil. The drawings employ a wide array of media and skilled drafting techniques. They also demonstrate the transition in teaching architecture from the Beaux-Arts model to Modernism. The drawing collection documents many kinds of stories, including the early work of gifted students guided by inspired instruction. Among the architecture faculty from the late 1920s through the 1940s, Lionel Pries was one of the most influential and revered. During his career, Pries developed into one of the region's foremost designers and instructors. His rigorous teaching methods, which supported the artistic and conceptual process of design and emphasized place in architectural design, shaped the thinking of a generation of influential Northwest Architects. The items on exhibit here were selected to highlight graduates of the program who proceeded to have influential careers, regionally and nationally. There is work by Roland Terry and Paul Thiry, both central to the regional approach to Modernism; Minoru Yamasaki, who designed the World Trade Center; and Victor Steinbrueck, whose commitment to historic preservation and activism are still echoed Seattle today. Not all Architecture graduates became architects. George Nakashima went on to become a world-renowned woodworker, and Ken Anderson had a 44-year career at Disney. In 2006, approximately 1100 drawings dating from 1914-1947, and some from the 1950s were transferred from the Department of Architecture to the Libraries' Special Collections. Since then, a project has been underway to conserve and house the drawings, as well as create an online finding aid to improve access for researchers. 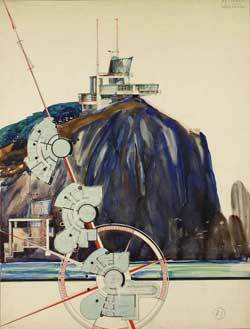 This exhibit is an opportunity to appreciate examples from the Architecture Student Drawing Collection and the teaching and design legacy they represent. A County Courthouse, 1933. Design drawing: gouache/watercolor with graphite and ink on paper. bridge ca. 1925-29. Freehand sketch: graphite on paper. A Tennis Court Building, 1925. Design/analytique: graphite, ink, watercolor on paper. Marco Polo Beaux Arts Ball, ca. 1930-33. Program cover: gouache/watercolor, ink and graphite on paper with matting. Protestant Church and Sunday School Group, 1933. Design drawing: gouache/watercolor with graphite and ink on paper. Bagley Hall, ca. 1926-7. Freehand sketch: graphite on paper.